There are many ways to save money on your weekly shopping – and reduce your impact on the environment. You should start by looking at the places you shop and the type of products you buy.Lots of people automatically pick up the branded version of cornflakes, baked beans or soup because they are familiar with the name through advertising. But quite often, the supermarket own brand is just as good but costs a lot less. Do You Shop Locally on a Regular Basis? Everyone should make an effort to support their local shops – they can’t exist without your custom! We all moan when local shops close – but it’s down to us to support them. Otherwise we’ll one day live in a world where even a little shopping list will mean getting in the car to drive to a major supermarket. Buying local doesn’t have to be expensive. Even smaller shops have special offers – and often they get supplies of bakery or dairy products from local producers so your support for the local economy is two-fold. If you buy fresh produce from reputable local shops such as the village bakery or fruit and vegetable shop it’s likely to be fresher – and will almost certainly come with less packaging. Often, supermarket goods come with massive amounts of packaging needed to protect them on cross-country journeys. Is there a local farm shop close by? If so, you can buy fresh meat, eggs and maybe butter and cheese and you know exactly where it has come from! Fruit and vegetable shops often have lower prices than supermarkets – especially for certain items. Ginger, for example, is usually less than half the price and you can save more money if you choose seasonal fruit and vegetables. Small specialist shops often have a much wider product range and staff are usually happy to provide advice on how to cook something you haven’t bought before. Do You Shop Around to Find the Best Prices? If you do a big weekly shop at a single supermarket, you are almost certainly spending more than you need to – and wasting money on fuel too. If you shop locally for a lot of fresh items, you could reduce your supermarket visits to fortnightly or even monthly. You could also save money by looking for special offers. Most stores have “loss-leaders” to entice customers through the door and offers such as Buy One Get One Free or 3 for 2 are now becoming commonplace. Of course, it’s not good for the environment to spend lots of extra petrol driving around searching for offers – and you’ll be spending more on fuel. Instead, you could check prices and special deals on internet price comparison sites and, assuming the item on offer is something that will store, you can benefit from the multi-purchase and put it away until needed. But be very wary of offers such as Buy 2 for £2. Often, you are saving only a few pence by buying double and if it’s something that won’t store well, those pence will be wasted because the food will end up in the dustbin. One good idea is to arrange with family or close friends to let each other know when there’s a great deal available. If you shop in one supermarket while your mum prefers another, you can pick up bargains for each another. It can become a great little competition – seeing who finds the biggest bargain of the week! Large supermarkets often have excellent offers on items such as large packs of toilet tissue. It may seem like a lot to buy at once but buying in bulk will work out a lot cheaper – and of course, you are less likely to run out of loo rolls too! Soap powder is another favourite with bulk buyers because savings can be considerable. You can also buy wholesale-sized packs of frozen goods which may be a little less convenient to use – but they will save you money and avoid excess packaging. Do You Use the Internet to Order Your Food Shopping? It’s a great idea to do this once a month or so. 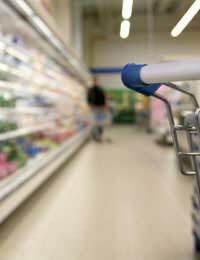 Some supermarkets regularly offer free delivery to persuade you to shop with them again or offer a discounted delivery price on certain days. You’ll save time and you can bulk-buy without worrying about how to get it all home. Finally, remember to take shopping bags with you every time you shop – and if you are not going too far, leave the car at home. That way you’ll be saving money on fuel, getting extra exercise and reducing your carbon footprint!